Aberrant activation of with no lysine (WNK) kinases causes familial hyperkalemic hypertension (FHHt). Thiazide diuretics treat the disease, fostering the view that hyperactivation of the thiazide-sensitive sodium-chloride cotransporter (NCC) in the distal convoluted tubule (DCT) is solely responsible. However, aberrant signaling in the aldosterone-sensitive distal nephron (ASDN) and inhibition of the potassium-excretory renal outer medullary potassium (ROMK) channel have also been implicated. To test these ideas, we introduced kinase-activating mutations after Lox-P sites in the mouse Stk39 gene, which encodes the terminal kinase in the WNK signaling pathway, Ste20-related proline-alanine–rich kinase (SPAK). Renal expression of the constitutively active (CA)-SPAK mutant was specifically targeted to the early DCT using a DCT-driven Cre recombinase. CA-SPAK mice displayed thiazide-treatable hypertension and hyperkalemia, concurrent with NCC hyperphosphorylation. However, thiazide-mediated inhibition of NCC and consequent restoration of sodium excretion did not immediately restore urinary potassium excretion in CA-SPAK mice. 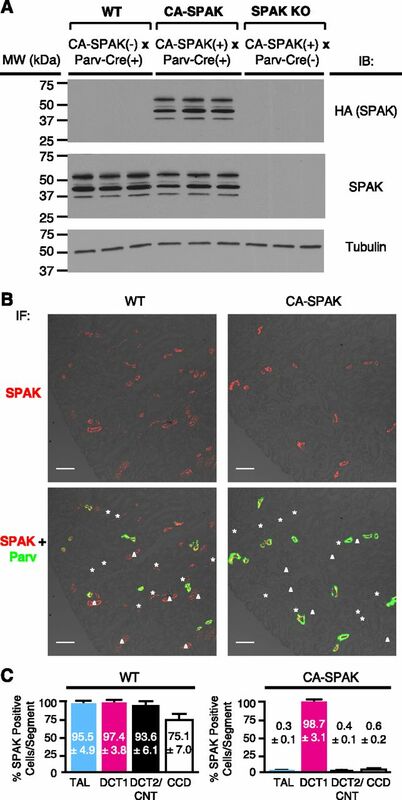 Notably, CA-SPAK mice exhibited ASDN remodeling, involving a reduction in connecting tubule mass and attenuation of epithelial sodium channel (ENaC) and ROMK expression and apical localization. Blocking hyperactive NCC in the DCT gradually restored ASDN structure and ENaC and ROMK expression, concurrent with the restoration of urinary potassium excretion. These findings verify that NCC hyperactivity underlies FHHt but also reveal that NCC-dependent changes in the driving force for potassium secretion are not sufficient to explain hyperkalemia. Instead, a DCT-ASDN coupling process controls potassium balance in health and becomes aberrantly activated in FHHt. With no lysine (WNK) kinase signaling cascades form a molecular switch that adjusts the aldosterone response of the kidney to either retain sodium or excrete potassium depending on physiologic need. According to current understanding, WNK signaling pathways differently regulate electrolyte transport processes in the distal tubule segments, allowing sodium to be absorbed with chloride in the distal convoluted tubule (DCT) or exchanged with potassium in the aldosterone-sensitive distal nephron (ASDN). WNK activation by Angiotensin II in the high aldosterone state of intravascular volume depletion1–4 supports salt absorption in the DCT, whereas potassium-dependent inhibition of the WNKs5,6 favors potassium excretion by the ASDN in potassium excess. To test these ideas, we developed a DCT-specific knock-in mouse model of constitutively active (CA) Ste20-related proline-alanine–rich kinase (SPAK) of the STK39 gene, the terminal kinase in the WNK-NCC signaling pathway.10,16,17 On activation by WNKs, phospho-SPAK binds to and phosphoactivates NCC.18–21 SPAK knockout (KO)18,19,21 or loss of kinase-function17 mice display a salt-wasting phenotype identical to NCC null mice, phenocopying Gitelman syndrome in humans, which is caused by loss of function mutations in SLC12A3, encoding NCC.22 Here, we show that specific expression of CA-SPAK within the early distal convoluted tubule (DCT1) drives FHHt. Surprisingly, tubular remodeling of the ASDN and inhibition of renal outer medullary potassium (ROMK) and epithelial sodium channel (ENaC) accompany NCC activation in the DCT1, revealing a mechanism to explain urinary potassium retention in FHHt. A CA-SPAK, containing phosphomimetic mutations at the key activation sites (T243E and S383D),23 was introduced in the mouse SPAK gene (Supplemental Figure 1A). CA-SPAK was HA epitope tagged for detection and placed after an Lox-P flanked selection cassette (Supplemental Figure 1B), allowing targeted expression with a cell-specific Cre recombinase (Supplemental Figure 1C). Taking advantage of DCT1-specific expression of parvalbumin (Parv) within the kidney,24,25 the Parv promoter was used to specifically drive kidney Cre recombinase expression in DCT1 (Supplemental Figure 1D). CA-SPAK mice (CA-SPAK+/+ × Parv-Cre+/−) were compared with SPAK KO littermates (CA-SPAK+/+ × Parv-Cre−/−) and wild-type (WT) mice expressing Parv-Cre (WT, Parv-Cre+/−). As detected with anti-HA antibodies, the HA epitope–tagged knock-in protein was found in the kidney cortex but was not found in the medulla of CA-SPAK mice, and it was absent in WT and SPAK KO kidneys as expected. Anti-SPAK immunoblots corroborated that CA-SPAK proteins have the same molecular masses as WT SPAK, including the full-length protein (60 kD)18 and smaller species (Figure 1A). Because CA-SPAK is engineered from the entire SPAK open-reading frame, the smaller SPAK proteins are likely proteolytic fragments26 rather than alternative SPAK gene products.19 Quantitative confocal microscopy with tubule-specific markers (Figure 1, B and C) revealed that CA-SPAK expression is restricted to Parv-positive DCT cells, contrasting WT SPAK, which is also found in nearly all DCT2, thick ascending limb, connecting tubule, and cortical collecting duct cells. These findings verify that CA-SPAK is appropriately expressed and specifically targeted to DCT1 on an SPAK null background. CA-SPAK is targeted to DCT1. (A) Representative Western blots of CA-SPAK (HA tag) and WT SPAK in the kidney cortex of WT and CA-SPAK knockin mice with anti-HA or -SPAK antibodies. (B) Confocal microscopy and colocalization of WT or CA-SPAK (red) with Parv (green) to identify the DCT1. *Antibodies to NKCC2 (not shown) identified the thick ascending limb. ΔAntibodies to NCC and calbindin (not shown) identified the DCT2/CNT. (C) Tubule segment expression of SPAK expression was quantified as the percentage of cells within a specific nephron segment that has SPAK (n=4 animals per genotype, >100 cells per nephron segment per animal counted). NCC phosphorylation was assessed at the key activation site (T58).20,27 As shown in the representative immunoblot (Figure 2A) and quantified by densitometry (Figure 2B), phosphosodium chloride cotransporter (pNCC) abundance is significantly greater in CA-SPAK mice than WT (and SPAK KO) mice (Supplemental Figure 2). Total sodium chloride cotransporter (tNCC) protein abundance is also increased, presumably a consequence of phosphorylation-dependent stabilization of the transporter28 and hypertrophy of the DCT1 (see below). 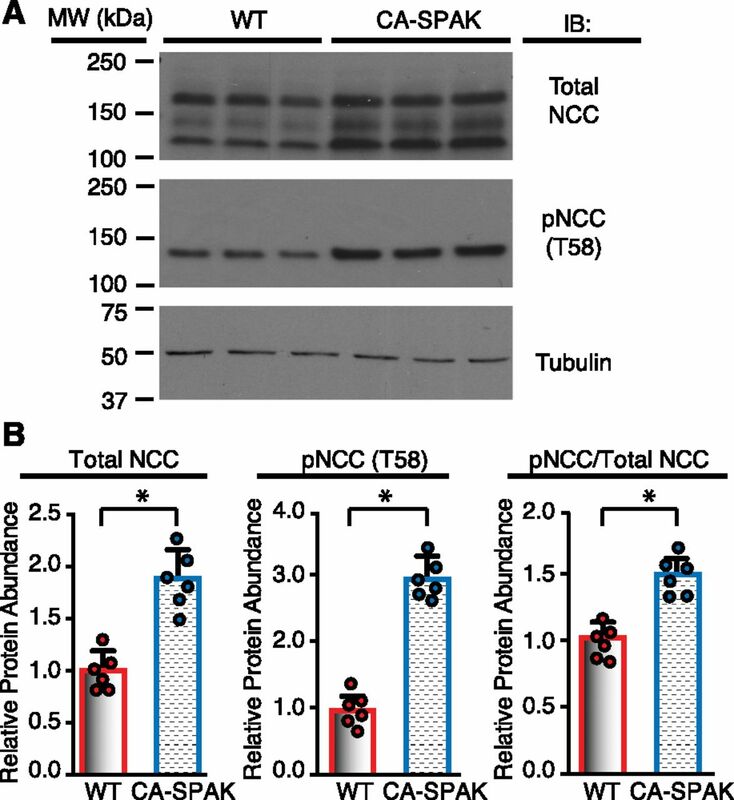 An increase in the pNCC-to-tNCC ratio was observed, consistent with enhanced SPAK activity. Because CA-SPAK mice display hyperkalemia and hypertension (see below) that should suppress pNCC,29,30 the sustained increase in pNCC is indicative of constitutive SPAK activity. Confocal microscopy (Figure 3A) and quantitative image analysis (Figure 3B) confirmed that the increases in apical membrane pNCC and tNCC are confined to DCT1, where CA-SPAK is specifically expressed. In neighboring DCT2 cells, pNCC is suppressed, presumably a result of the SPAK null background. These findings indicate that targeted expression of CA-SPAK in DCT1 is sufficient to drive NCC hyperphosphorylation. NCC is hyperphosphorylated in CA-SPAK mice. (A) Representative Western blots and (B) quantitative analysis of tNCC, pNCC (T58), and the ratio of pNCC to tNCC in WT (red) versus CA-SPAK (blue) mice. Bars and wickers are means±SEM, and circles are individual data points from each mouse (n=6 per genotype). *P<0.05. Increased NCC and pNCC (T58) abundance is restricted to the DCT1 in CA-SPAK mice. (A) Colocalization of tNCC (red) and pNCC (green) with Parv (cyan). Dashed lines demarcate the transition between the DCT1 and the DCT2 in contiguous nephron segments. Mean P<0.05, WT vs. CA-SPAK (B) Quantification of the apical membrane delimited pixel intensity of pNCC (T58) and tNCC. Bars and wickers are means±SEM, and circles are individual data points from each mouse (n=6 animals per genotype with >60 cells per segment measured per animal). *P<0.05. CA-SPAK mice exhibit the salient electrolyte abnormalities of FHHt (Table 1), identical to mice bearing FHHt mutations in WNK131 and WNK4.10,32 Hyperkalemia and metabolic acidosis are observed without changes in plasma aldosterone or creatinine clearance. They also display a reduction in hematocrit and BUN, consistent with intravascular fluid expansion from unrestrained renal salt absorption. By contrast, CA-SPAK+/+ littermates without Cre (Parv-Cre−/−) exhibit a phenotype resembling Gitelman syndrome and SPAK KO mice,18,19,21 with metabolic alkalosis, hypokalemia, and increased BUN and hematocrit. Thus, DCT1-specific expression of CA-SPAK in an SPAK KO background is sufficient to reverse the electrolyte disorder of Gitelman syndrome to FHHt. Telemetric measurements of BP in conscious, unrestrained mice (Figure 4, Supplemental Figure 3) revealed that CA-SPAK mice (Supplemental Figure 3A) have significantly higher systolic and diastolic BPs than WT mice. Hypertension was especially pronounced during the active, awake period (Figure 4A, Supplemental Figure 3). Dietary salt loading exacerbated hypertension in CA-SPAK mice but had no effect on BP in WT mice (Figure 4A). Salt-sensitive hypertension in the face of low renin (Table 1) is consistent with an aberrant gain in renal sodium absorption. Remarkably, hydrochlorothiazide (HCTZ; 25 mg/kg body wt intraperitoneally) quickly normalized (12 hours) BP to WT levels, coincident with correction of the HCT and BUN. Thiazides can have modest off-target effects, including inhibition of carbonic anhydrase33,34 and inhibition of pendrin/NDCBE in B-intercalated cells.35 However, HCTZ specifically inhibits NCC with the dose used here. These findings indicate NCC hyperactivation, and exaggerated salt absorption in DCT1 is sufficient to cause hypertension (Figure 4A). 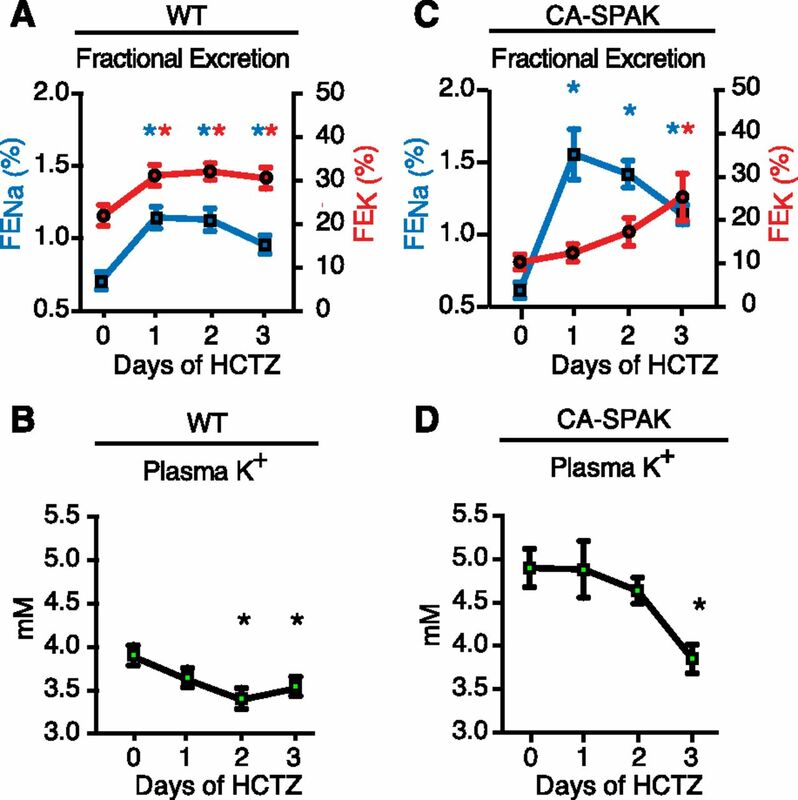 CA-SPAK mice develop HCTZ-remediated salt-sensitive hypertension and hyperkalemia. (A) Average systolic BP (SBP) during the awake period in the presence of vehicle or HCTZ (25 mg/kg body wt) after 3 days of treatment on control diet or high-sodium diet (HNa). (B) Plasma potassium concentration under basal conditions or after dietary potassium loading (HK) in the presence of vehicle or HCTZ (3 days treatment). (C) Urinary potassium excretion relative to amount filtered (fractional excretion of potassium [FEK]) in the presence of vehicle or HCTZ (3 days treatment). WT (red) and CA-SPAK (blue) bars and wickers are means±SEM, and circles are individual data points from each mouse (n=6 per genotype per treatment). *P<0.05, WT versus CA-SPAK undergoing same treatment; **P<0.05, vehicle versus HCTZ in same genotype; ***P<0.05, control diet versus experimental diet in the same genotype. Renal responses to dietary potassium loading and HCTZ were evaluated to explore the mechanism underlying hyperkalemia. In contrast to WT mice, which tolerate dietary potassium loading, hyperkalemia in CA-SPAK is exacerbated by a potassium-rich diet (Figure 4B). CA-SPAK mice exhibit lower rates of urinary potassium excretion (fractional excretion of potassium in Figure 5C or UKV in Supplemental Figure 4B) than WT mice and SPAK KO littermates (Figure 5A, Table 1) and are unable to develop a significant transtubular potassium gradient (Supplemental Figure 5A), indicative of impaired potassium secretion from the ASDN. HCTZ corrects the hyperkalemia (Figure 4B) and restores urinary potassium excretion (Figure 4C) and transtubular potassium gradient (Supplemental Figure 5B) to WT levels. Taken together, these findings indicate that NCC hyperactivity underlies urinary potassium retention in CA-SPAK mice. Delayed restoration of urinary potassium excretion and plasma K+ in CA-SPAK mice. Fractional excretion of urinary sodium (FENa; blue; left axis) and fractional excretion of potassium (FEK; red; right axis) in (A) WT and (C) CA-SPAK mice after HCTZ treatment with corresponding changes in plasma potassium concentrations in (B) WT and (D) CA-SPAK. Dots and wickers are means±SEM (n=6). *P<0.05 for treatment versus day 0 within genotype. To test whether reduced distal sodium delivery limits potassium excretion, we monitored the temporal natriuretic and kaliuretic responses to HCTZ (Figure 5, Supplemental Figure 6). The sodium delivery hypothesis predicts that potassium excretion should abruptly increase in CA-SPAK mice when sodium excretion rapidly increases with NCC inhibition. Surprisingly, we found that urinary potassium excretion and plasma potassium are slowly restored to WT levels (Figure 5, A and B) over 3 days of HCTZ treatment in CA-SPAK mice (Figure 5, C and D), long after the prompt natriuresis is induced (Figure 5, A, WT and C, CA-SPAK, Supplemental Figure 5). Thus, decreased sodium delivery does not explain compromised potassium excretion in CA-SPAK mice. The distal nephron undergoes extensive cellular remodeling in response to inhibition of NCC,18,19,36–38 characterized by DCT atrophy and ASDN hypertrophy. To determine if opposite structural changes occur in the CA-SPAK mice, confocal microscopy with distal segment–specific markers was performed, and distal tubule morphology was evaluated quantitatively by stereology. As summarized in Figure 6, we observed that the tubule length and cross-sectional area (Figure 6, A and B) of the DCT1 (Parv/NCC-positive tubules) (green in Figure 6A) expand in CA-SPAK mice, similar to the increase in DCT1 mass in FHHt-WNK1 mice31 and FHHt-WNK4 transgenic mice.10,32 This was paralleled by a decrease in length and cross-sectional area of calbindin/AQP2-labeled CNT (red in Figure 6A) but not the DCT2 (calbindin NCC positive), CNT1 (calbindin positive but NCC and AQP2 negative),39 or CCD (AQP2 positive),39 consistent with a specific decrease in CNT mass. Because potassium secretion is most avid in this early part of the ASDN,40 the reduction in the CNT is expected to severely compromise potassium excretion in the CA-SPAK mice. Importantly, HCTZ treatment reversed the structural remodeling (Figure 6, B and C), indicating that NCC overactivity is necessary to drive the remodeling response. ASDN mass is reduced in DCT1-targeted CA-SPAK mice. (A) Representative images of distal nephron marker staining (DCT1 in green and CNT in red) showing changes structural changes. (B) Quantitative assessment of cortical distal nephron segments (DCT1, DCT2, CNT, and CCD) revealed that the length and area of DCT1 segments increased in CA-SPAK mice, with a commensurate decrease in the length and area of CNT segments. (C) The structural changes in CA-SPAK DCT1 and CNT are normalized after 3 days of HCTZ (n=6 animals per genotype with area of all labeled nephron segments measured). *P<0.05. The reduction in CNT mass was paralleled by a decrease in ENaC, which provides a large electrical driving force for potassium secretion through ROMK and BK channels in the CNT.41,42 Indeed, benzamil-sensitive (4.3 mg/kg body wt intraperitoneally) sodium reabsorption was significantly reduced (Figure 7A) in CA-SPAK mice. Biochemical assessment of ENaC revealed a decrease in α- (full-length) and γ-ENaC but not the β-subunit (Figure 7, B and C). Furthermore, the cleaved form of α-ENaC was also reduced,43 raising the possibility that post-translational activation may also be compromised. Thus, ENaC attenuation likely contributes to potassium retention in CA-SPAK mice. CA-SPAK mice have blunted sensitivity to benzamil and reduced ENaC expression. (A) Although the rate of urinary sodium excretion is not different between WT and CA-SPAK mice, benzamil (4.3 mg/kg body wt intraperitoneally) significantly increases WT urinary sodium excretion rate (UNaV) above that in CA-SPAK (n=6). (B and C) Quantitative assessment of ENaC subunit expression was performed by Western blotting and showed reduced α- and γ-ENaC abundance (n=4 animals per genotype). WT (red) and CA-SPAK (blue) bars and wickers are means±SEM, and circles are individual data points of each mouse. *P<0.05. We also evaluated the two potassium channels that mediate potassium secretion, BK (Figure 8) and ROMK (Figure 9). Western blot analysis revealed that the accessory B1 subunit is decreased, but the pore-forming α-subunit and accessory B4 subunit are surprisingly increased in CA-SPAK kidney cortical homogenates compared with the WT. Thus, urinary potassium retention in CA-SPAK mice cannot be explained by BK downregulation. By contrast, ROMK channels, which are especially regulated in DCT2 and CNT to maintain potassium excretion,39 were significantly reduced in CA-SPAK mice. A striking reduction in the abundance of the ROMK protein was observed within the CA-SPAK renal cortex compared with WT (Figure 9, A and B) or SPAK KO littermates (Supplemental Figure 6, A and B) but not in the Loop of Henle–enriched medulla (Figures 9A and B, Supplemental Figure 6, C and D). Confocal microscopy revealed that apical ROMK localization and abundance along all segments of the ASDN were strikingly reduced in the CA-SPAK mice compared with WT (Figure 9C) or SPAK KO mice (not shown). It might be argued that WNKs could be activated in CA-SPAK mice as part of a compensatory response that predisposes the mice to inhibit ROMK. However, we found that WNK1, pWNK1, and WNK4 are actually reduced (Supplemental Figure 7), indicating that ROMK must be inhibited by a WNK-independent pathway in CA-SPAK mice. Significantly, HCTZ restored ROMK expression to normal levels within 3 days of treatment, coincident with gradual correction of hyperkalemia and potassium excretion (Figure 9, E and F) and restoration of CNT mass (Figure 6C). These observations reveal that enhanced NCC activity in the DCT1 not only drives dystrophic CNT remodeling but also, inhibits apical ROMK localization and expression along the entire ASDN. 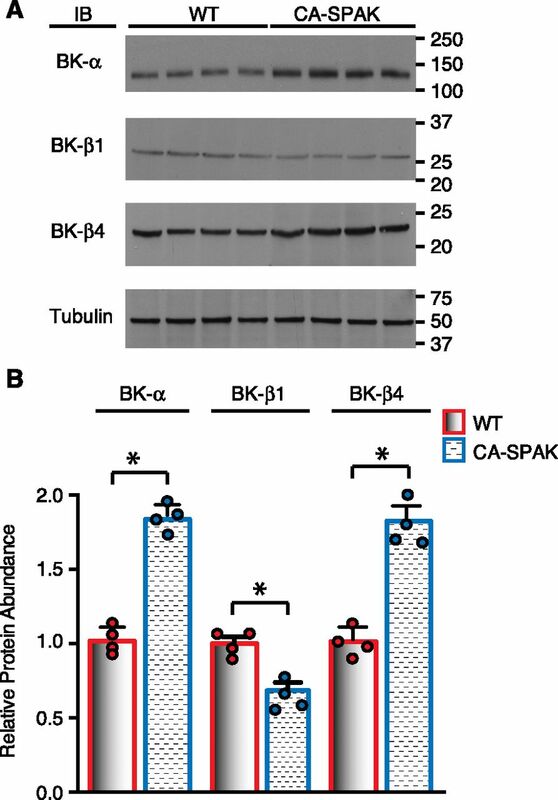 Cortical big potassium channel (BK) expression is reduced in CA-SPAK mice. Cortical BK-α, -β1, and -β4 protein abundance was assessed by (A) Western blots and (B) quantification (n=4). WT (red) and CA-SPAK (blue) bars and wickers are means±SEM, and circles are individual data points of each mouse. *P<0.05. ROMK expression within the ASDN is reduced in DCT1-targeted CA-SPAK mice. Cortical ROMK protein abundance was assessed by (A) Western blots and (B) quantification (n=6). *P<0.05. (C) Immunolocalization of ROMK in typical DCT2, CNT, and CCD along with (D) quantification of apical ROMK abundance along individual segments of the ASDN (n=4 animals per genotype and >75 cells per nephron segment). *P<0.05. (E) Representative cortical ROMK Western blots and (F) quantitative analysis in CA-SPAK and WT animals after 3 days of HCTZ treatment (n=6). WT (red) and CA-SPAK (blue) bars and wickers are means±SEM, and circles are individual data points of each mouse. *P<0.05. The finding of Lalioti et al.10 that genetic ablation of NCC abolishes hypertension and hyperkalemia in WNK4-FHHt transgenic mice provided compelling evidence that enhanced NCC activity in the DCT is necessary to drive the FHHt phenotype. Our studies reveal that aberrant activation of the NCC in the DCT1 is sufficient to initiate FHHt. Using a Parv promoter–driven Cre recombinase, we specifically targeted renal expression of a CA-SPAK mutant to DCT1. In contrast to the negligible effects of overexpressing NCC in the DCT,44 CA-SPAK mice phenocopy FHHt. Although Parv-positive cells outside the kidney may express CA-SPAK, hypertension and hyperkalemia were completely reversed by inhibiting NCC. These findings reinforce the importance of the early distal tubule and phosphoactivation of NCC45 in the control of salt balance, intravascular volume, and BP. They also reinforce the concept that renal potassium excretion from the ASDN is strongly and negatively influenced by NCC activity but not by the suspected mechanism of reduced sodium delivery. We found that an unexpected distal tubule (DCT-ASDN) coupling process inversely links NCC activity to urinary potassium excretion. Traditionally, it has been thought that NCC activation negatively influences potassium secretion by limiting sodium delivery to the ASDN. Contrary to the textbook view, we found that targeted CA-SPAK expression in the DCT1 is accompanied by an ASDN remodeling program characterized by ASDN dystrophy and inhibition of ENaC and ROMK. Normally, ENaC42 and ROMK are exquisitely regulated in the ASDN,8 allowing urinary potassium excretion to match dietary potassium intake.40 In CA-SPAK mice, ROMK expression becomes so compromised that the ASDN is unable to efficiently secrete potassium, even when sodium delivery is acutely activated. Gradual correction of urinary potassium excretion and the hyperkalemia in the CA-SPAK mice with thiazide diuretics coincides with the return of ENaC and ROMK expression to WT levels. Taken together, these finding indicate that structural changes in the ASDN and diminished ENaC and ROMK apical membrane expression limit urinary potassium excretion when NCC becomes hyperactive, providing a new mechanism to explain how aberrant activation of NCC causes thiazide-correctable hyperkalemia in FHHt. The distal tubule coupling process likely influences potassium balance in health. Recent breakthrough studies revealed that low plasma potassium directly activates WNK-SPAK signaling in the DCT to stimulate NCC,46 but it has been mysterious how potassium sensing in the DCT is communicated downstream to limit potassium secretion by the ASDN. Contrary to the widely held view, careful kinetic determination of sodium-dependent potassium secretion indicates that physiologic changes in sodium delivery are not sufficient to significantly alter the driving forces for potassium secretion47 or explain NCC-dependent modulation of potassium secretion from the ADSN.48 We propose that NCC-dependent changes in sodium delivery shape longer-term “remodeling” of the potassium secretory machinery in the ASDN, reminiscent of the way that sodium modulates DCT structure and transport.49 It will be interesting to learn if CNT-specific ENaC KO mice have dystrophic CNT as predicted if sodium is the sole mediator of the remodeling process. Other transtubular coupling mechanisms, such as paracrine communication, which has been implicated in ASDN hypertrophy in SPAK KO mice,38 should also be considered. WNK-SPAK–dependent activation of NCC by low potassium50 together with the DCT-ASDN inverse coupling mechanism described here would provide an effective means to conserve sodium and potassium, especially in fasting states when dietary sodium and potassium are limiting. It is important to recognize that the ASDN phenotype of CA-SPAK mice may be different than that of some of the WNK FFHt mouse models. Altered regulation of ROMK and ENaC has been reported, but the phenotypes are surprisingly divergent manners depending on the WNK FFHt model. 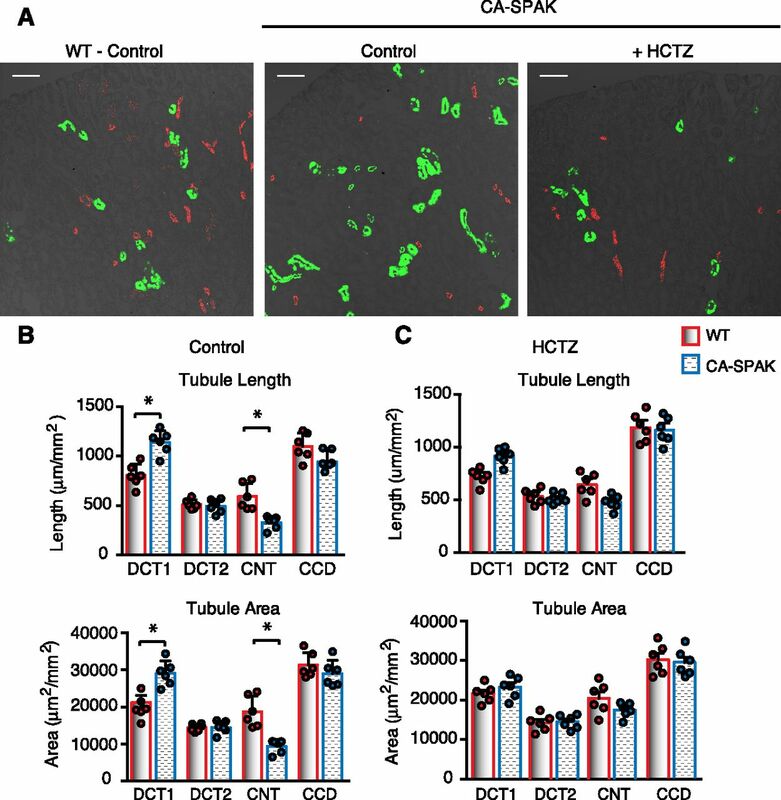 Recently, Zhang and coworkers51 found that ROMK and ENaC activities are suppressed in the late DCT/early CNT of mice transgenic for WNK4 FFHt, identical to CA-SPAK mice. By contrast, WNK4 FFHt mice were reported to have increased ENaC activity and no change in ROMK protein abundance, although ROMK was misidentified with a nonspecific antibody.32 WNK1 FFHt mice exhibit another ASDN phenotype characterized by a decrease in ROMK abundance in the late DCT and no change in ENaC.31 On the basis of these variable observations and findings in vitro that WNKs have the capacity to increase ENaC activity52,53 and decrease ROMK,8 it seems likely that disparate ASDN phenotypes are shaped by effects of different WNK signaling pathways in the ASDN. Our results in CA-SPAK should not be interpreted that WNK signaling in the ASDN does not play a role in FHHt or physiologic regulation of ROMK and ENaC. Our understanding of renal potassium balance has been transformed by a confluence of recent discoveries, revealing a molecular switch, orchestrated by WNK-SPAK signaling, that shifts the balance of distal nephron transport activities between the DCT and the ASDN. This study reveals that WNK-SPAK signaling in the DCT1 is sufficient to drive the switch mechanism to activate salt transport from the DCT and suppress potassium secretion from the ASDN through a surprising transtubule coupling mechanism. Methods were performed as previously reported18,38 and are detailed in the Supplemental Methods and Supplemental Tables 1 and 2. Animal studies were performed in adherence to the National Institutes of Health Guide for the Care and Use of Laboratory Animals and approved by the University of Maryland School of Medicine Institutional Animal Care and Use Committee. Funding for this project was provided National Institutes of Health Grants DK63049, DK54231, and DK093501 (to E.D. and P.A.W.). See related editorial, “Nephron Remodeling Underlies Hyperkalemia in Familial Hyperkalemic Hypertension,” on pages 2555–2557. This article contains supplemental material online at http://jasn.asnjournals.org/lookup/suppl/doi:10.1681/ASN.2016090948/-/DCSupplemental.